Hi Michele! It will make around 16 cups of mix. We make our Chex Mix using the prepackaged and seasoned Chex Mix bags. I usuually get them at Walgreens when they are on sale and use a coupon. Can’t beat the price and you don’t have leftover boxes sitting around. Everybody raves about our mix! Quick question for you! I only have a 4 1/2 cup crock pot but would love to make this recipe as well without it overflowing on me! Recommendations for how to modify this without having to just cut everything in half? Want a big batch, just maybe slightly smaller so it’ll fit! :) Thanks! Sabrina, do you mean a 4.5 quart Crock-Pot? You’d need to cut out about 6 cups between the Chex, Cheerios and pretzels to make it fit. I’d recommend cutting three of them back to 2 cups each and the remaining two to 1.5 cups each. The nuts can stay the same. hi, has anyone ever tried making ‘honey nut’ chex mix. i love the store bought one and was curious if this could be adapted to be kinda like that one. I have a new digital crockpot that’s had pre settings like 4 hr 6hr 8hr 10hr what setting do you suggest I use? Hmm, it stands to reason that a shorter cooking time would need a higher temperature. So my guess is that the 4hr setting would be high and 10hr would be low. You may want to keep a close eye on it while on the high setting to ensure that it doesn’t burn. If it seems too hot, try turning it down to the 6hr setting. Hope that helps! If you try it and have a moment to report your results, I’m sure it would help others tremendously. I’m making this now with the new digital crockpot. It’s almost done and the 4 hour 10 cook times were exactly right. Thanks this made my childhood memories so much easier. I’ve been making mine in the microwave in a big plastic bowl. Two minutes (on high), stir, repeat twice. Six minutes total. It works great. instead of pretzels, add a can of french fried potato sticks. yum. Just wondering if you think this would work with puppy chow??? Have to try this one as well! Thanks for sharing. GO BUCKS! I made this for a get together this weekend and it was awesome! I could not stop eating it as it cooled off! This is a keeper to make as a snack for the kids or for a party! So glad you liked it, Melissa! I love it when it’s still warm too. so it should be uncovered… and you used 2 sticks of butter??? i have been making nuts & bolts every christmas and use the 1970s recipe -and ALWAYS add cheerios! but use 1 stick (1/2 cup) and always increase the seasoning salt and the worchestershire – add garlic and onion powder – no nuts – but am trying your recipe TODAY… thanks for any input! Yes, I use either 1 cup of vegetable oil or 2 sticks of butter — both are very good. If you use butter, make sure to stir it very well as you are pouring it in. And, yes, leave it uncovered. Hope you like it! I LOVE Chex Mix, but have never made it. And please don’t take this question as being negative in any way ……… Your recipe says that I have to stir frequently for a total of 110 minutes. (yikes!) Do you have to do this with the baked version too? If I have to stir that often, I think I’ll continue to buy it. GREAT to have a recipe, though, especially for people who need to lower their sodium intake and dabble with recipes to do that. Yes, you do have to stir the baked version as well to ensure that it browns evenly. It sounds like a lot, but it’s really most important as you get to the end of the cooking time when the crockpot has really heated up. I stir it about every 15 minutes to start and then every 10 minutes toward the end. I’m assuming this comes out crunchy, like the baked version does? I have not made it yet. 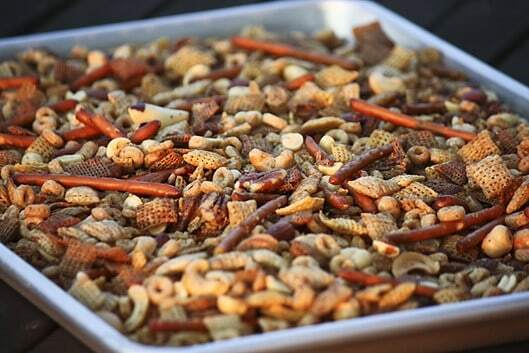 My mother always bought just one flavor of Chex to make party mix to save money (instead of having to buy 3 boxes). Just an idea for anyone looking to save $$. Yep, it’s crunchy just like the baked version! I would never use oil….only butter. The flavor would be much better and it’s not supposed to be health food. I love the Worcestershire flavor, so add extra. AND, I also add baby goldfish crackers (or regular…cheddar, of course.) I love Chex mix. I just inherited my mom’s big crockpot, so I might have to try this. Oh, and we’re Razorback fans here. :) My family (cousins, in-laws, etc) includes Arkansas, Alabama, and Auburn fans…you can imagine how my sister’s house was this weekend…she’s a Hog fan (went to Arkansas) and her husband is an Auburn fan. :) WPS! Oh, I bet that would be good! Yeah, I’d definitely wait to add it to the cooled mix — If you can wait. I can’t stop picking at it when it’s still warm, lol. By the way, it looks like Candace posted her recipe here: http://southerngoodeatin.blogspot.com/2011/09/crock-pot-candy.html Sounds yummy! We make this for holidays too, takes forever! The slow cook way sound great. maybe a dumb question, but is seasoned salt the same thing as lawerys salt? What a fun party food. Love the simplicity. Great idea, I had no idea you could make this in the slowcooker, but I plan to try it soon! My Chex Mix always flops for some reason. My husband is always so happy to get a batch from his sister. I will try your crock pot recipe what a great idea! PS. Do you leave the lid on or is the lid off during cooking? Good questions, Roberta! It should be uncovered, so I’ll make sure to add that to the instructions. As much as I’m a proponent of using real butter in recipes, I actually haven’t tried it in my Chex mix recipe — I guess because it’s the recipe that my mama passed down to me, and I figured if it ain’t broke, don’t fix it! If you decide to try it, the official Chex party mix recipe calls for what is roughly about 1/3 cup of butter, so I’d probably start with that amount and add more if needed knowing that butter will make for a much richer flavor. I’ve always used real butter. Margarine is unhealthy, loaded with chemicals and one molecule away from the formula for plastic. What about butter? Instead of Veggie Oil, that is? My unusual favorite is chocolate/nut candies. I’ll post the recipe soon! Mmm, I love a good salty/sweet combination. Sounds tasty! I love this snack mix! I know my kids and anyone over watching the game will too :) Love the pic of it! LOL, we have one lone neighbor that’s a Gators fan. We like to tease him, but he’s always welcome too!